MENTOR - The Mentor Area Chamber of Commerce annual State of the City meeting started with Neil Stein, chair of the Board of the Mentor Area Chamber of Commerce, welcoming everyone. 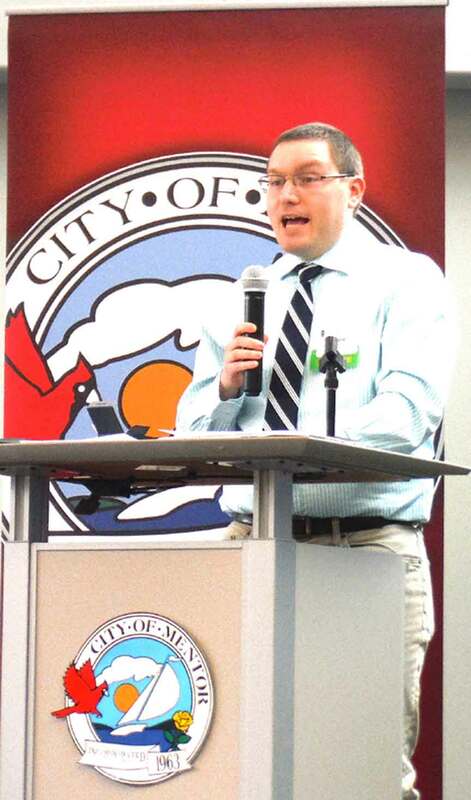 Jason Lea, community relations for Mentor Public Library, spoke about how the Mentor Public Library is celebrating its 200th anniversary this year. He mentioned they received a donation from the Francis M. Paulsen Irrevocable Trust Fund in the amount of $250,000. A new meeting center under this name will be created at the Mentor-on-the-Lake branch of the library. Lea also mentioned a new initiative the library is taking up to help combat the abuse of prescription drugs is with their Deterra Bags. “Eighty percent of heroin addiction starts by abusing prescription drugs,” Lea said. The way that the Deterra Bags work is by filling the bags with both the unused pills and water to safely throw them out. The bags will be available free at all Mentor library branches, and are paid for by several donors. The Mentor Public Library has also been working with Mentor Schools to create The Hub, where students can make everything from laser-engraved objects to T-shirts and music videos. Of course, with the library celebrating its 200th anniversary, there are several events and even contests going on throughout the year. “We are doing a lot of fun stuff for 200 years all year long,” Lea said. For more information on these happenings go to www.mentorpl.org/200th/.